Fans of buttermilk biscuits and gravy will enjoy this sweet take on a southern classic. While its texture is similar to a typical gravy and is thickened with flour, you don't make it in the traditional manner by adding liquid to a roux. Instead, you whisk together all the ingredients and heat it on the stovetop until it thickens. This makes about two cups of gravy. You can store it in the fridge and reheat it on the stovetop, thinning with additional milk if needed. From start to finish, the recipe takes less than 10 minutes to make. In a small saucepan, whisk together the cocoa powder, sugar, and flour. Whisk in the milk, salt, and vanilla. Put the pan on a burner on medium heat. Cook, whisking constantly, until the gravy starts to simmer and thickens, about five minutes. There are multiple ways you can vary this recipe. For dairy-free, substitute an equal amount of unsweetened almond milk for the whole milk. Omit the butter. For gluten-free, substitute an equal amount of a gluten-free, all-purpose flour for the wheat flour. Serve over almond flour biscuits. For sugar-free, replace the sugar with one teaspoon of liquid stevia. Make it vegan by replacing the milk with almond milk and the butter with a vegan butter. You can vary the flavor by replacing the 1/2 teaspoon of vanilla extract with one teaspoon any other extract. Try flavors such as mint extract, raspberry flavoring, almond extract, or orange extract. You can also add one teaspoon of orange zest to the dry ingredients in step one for great orange flavor. Try a slightly spicier version by adding 1/2 teaspoon of cinnamon and up to 1/4 teaspoon of cayenne to the dry ingredients in step one. For a chocolate peanut butter version, omit the butter. Instead, whisk in and completely incorporate two tablespoons of melted peanut butter in step four. While biscuits are the suggested breakfast accompaniment, you can also try the following. 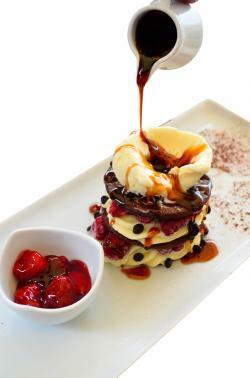 Drizzle it over ice cream and chocolate cookies, and add some strawberry sauce or strawberry jam for a delicious dessert. Serve it with strawberry shortcake as an additional sauce. Pour it on pancakes or waffles. Serve it as a warm dip with grilled fruit skewers. Fancy toast is all the rage! Mash bananas with 1/2 teaspoon of cinnamon and one teaspoon of honey, spread the mixture on toast, and drizzle with chocolate gravy. Toast banana bread and drizzle the gravy over it. Use it as a sauce for French toast or stuffed French toast. Purchase puff pastry cups from the freezer section of the grocery store. Fill them with your favorite yogurt, and top with a layer of fruit and a drizzle of chocolate gravy. Put a scoop of vanilla ice cream between two warm chocolate chip cookies and drizzle with the gravy for a warm, gooey treat. Spread a croissant with strawberry cream cheese and drizzle with the gravy. Serve as a sauce for a warm bread pudding. Use as a sauce for coffee cake. 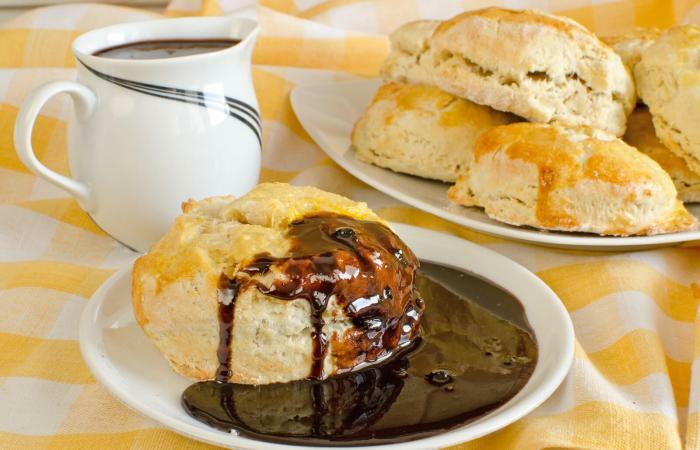 If you're looking for a quick, sweet and tasty sauce, then chocolate gravy is a delicious choice. It's easy to vary the flavors, and it goes well with many other foods. Whip up a batch and see for yourself.